One candle will be dressed, blessed and lit on your behalf on his feast day of June 13th. Offerings will be preapred and an altar set for this holy day. *** YOU MUST TYPE YOUR PETITION ON YOUR ORDER FORM IN THE "SPECIAL INSTRUCTIONS" AREA!!! I WILL NOT ACCEPT SEPARATE OR LATE PETITIONS. Eleggua (Legba, Exu, Eshu, St. Michael) is the Orisha of crossroads, doorways, and gates. He is the messenger of the gods- no Orisha can be contacted except through him, and his dress and conflicting mannerisms reflect this double-sided nature (he is sometimes depicted with two faces, especially in Yoruban art). Elegua is also the guardian of the doorway between the earthly and divine realms. He has been compared to the Greek God Hermes, with whom he shares many attributes, and to the Hindu Ganesha. He is also depicted as a great trickster. In Brazil, he is sometimes equated with Baphomet, and his symbol is a pitchfork. 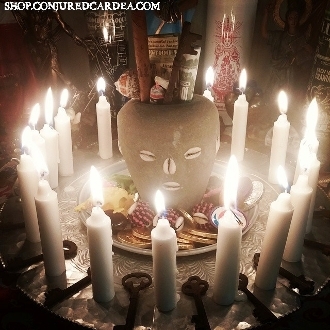 In Lukumi, he is a guardian of doorways, and effigies of Elegua are used to protect homes. He god of Chaos and Trickery, and plays frequently tempting choices for the purpose of causing maturation. He is a difficult teacher, but a good one. As an example, Elegua was walking down the road one day, wearing a hat that was red on one side and black on the other. Sometime after he departed, the villagers who had seen him began arguing about whether the stranger's hat was black or red. The villagers on one side of the road had only been capable of seeing the black side, and the villagers on the other side had only been capable of seeing the red half. They nearly fought over the argument, until Elegua came back and cleared the mystery, teaching the villagers about how one's perspective can alter a person's perception of reality, and that one can be easily fooled. In other versions of this tale, the two tribes were not stopped short of violence; they actually annihilated each other. The inability to see things from the others' point of view caused their demise. His colours are read and black, his number is 3, he is partial to children, toys, candy, cigars, smoked fish, black coffee, coconut, yams, honey, candles, and rum.